I came across this product mentioned on a blog reticently and as I had some very old original Farish Pullmans that I never run I thought I would try it out. 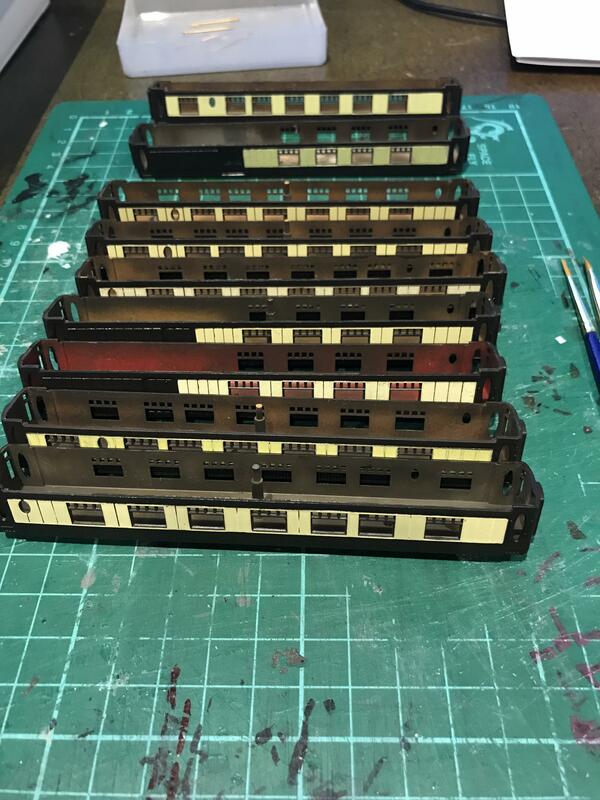 the label set allows up to 15 coaches to be converted creating the Golden Arrow and either the Bournemouth Belle or the Dover Boat Train, complete with sides, coach ends, loco boards and coach boards. 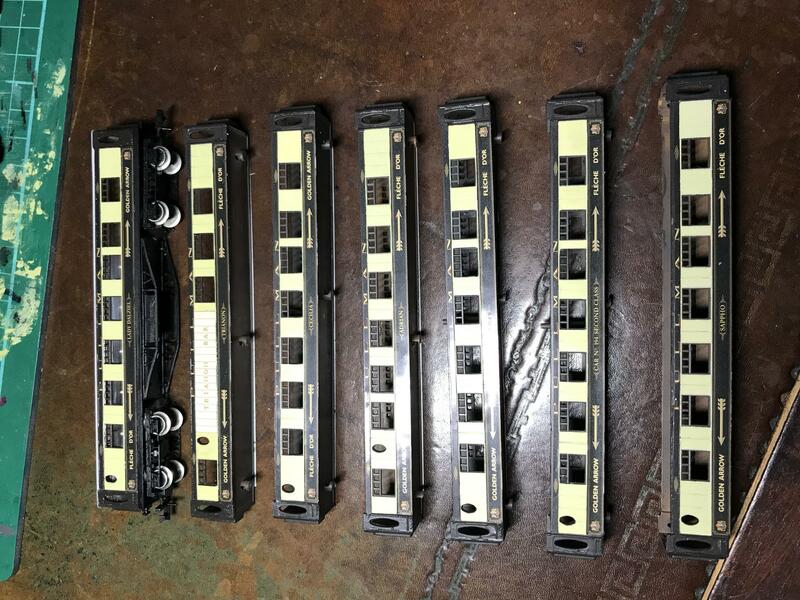 Basic preparation is to dismantle the coaches, and repaint them (if they are tatty), then apply the plastic printed labels and seal with a gloss solvent based varnish. A bit of work on the chassis and paint the roofs white and you end up with a very smart model. Very nice , now you've got me wanting some. I have the brakes just need some saloons oh and a southern engine to head the train. really I shouldn't get up this early ! That's a pretty impressive result for not much trouble. Thanks again for the heads-up! They look great in a rake. I did this some time ago, after reading an article by Dr.Al ( I think ),I just added some corridor connectors. 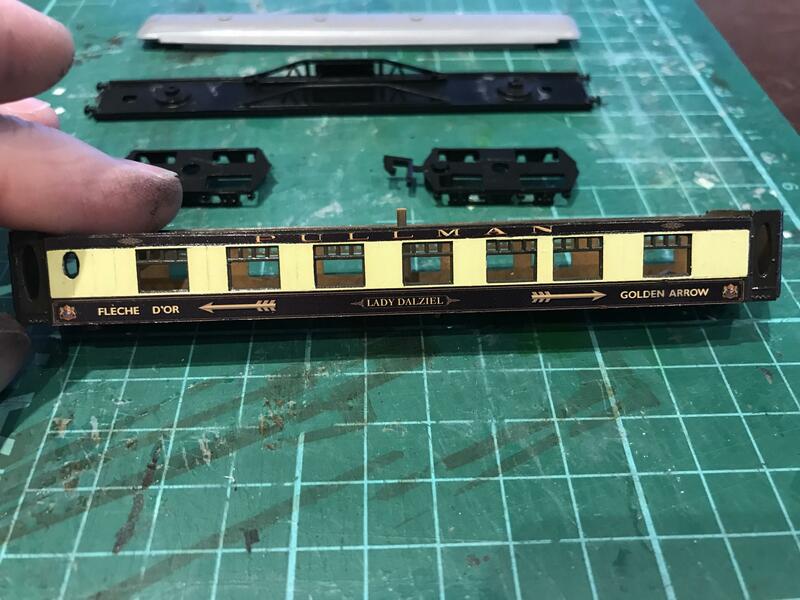 They turned out really nice,but no provision for Brake ends, also I would question the shade of brown used, but I think this is to match the original colour of the coach, I enhanced mine with some transfers representing the brass grab rails either side of the doors. I might try some gold leaf paint for the rails but it might be a step too much. The brown and cream on the transfers change with light and varnish, however, I have found the Humbrol railway paint matches well with the transfers. Having done one to prove the outcome I will now complete a full rake. The nice thing is its a simple project that is far less involved than a locomotive. 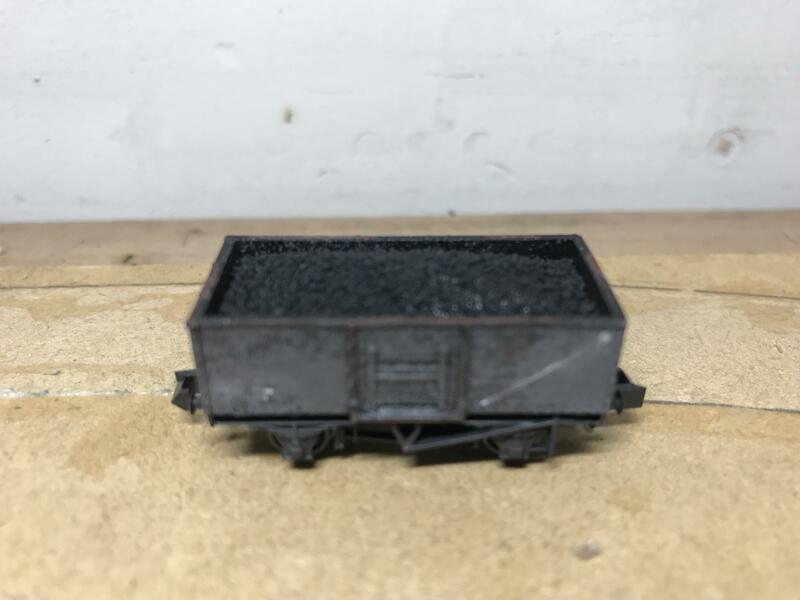 I also have completed over Christmas a rake of rusty 15T steel coal wagons using PECO Butterly wagons. The process is easy, first spray with a solvent based red oxide paint and leave to almost dry. then spray the inside and sides with a "mist" of acrylic mat black and the outsides with acrylic grey. The type of paint is important as when its dry you scrub the grey paint with a fiberglass pen. The effect is to scour the grey showing parches of blackened oxide and making a very good approximation of dirty rust. I then used a Rotring fine pen with white ink, which is also scratched with the fiberglass pen. The back two are ready, and the front ones are awaiting the windows area to be painted. You can clearly see the variance in paint due to wear and light bleaching over forty years. There will be a "run" on GF old Pullmans now on e-bay... Will have to wait a year or 2 to pick up any bargains now. so you can buy them ready weathered?? JLTRT?? 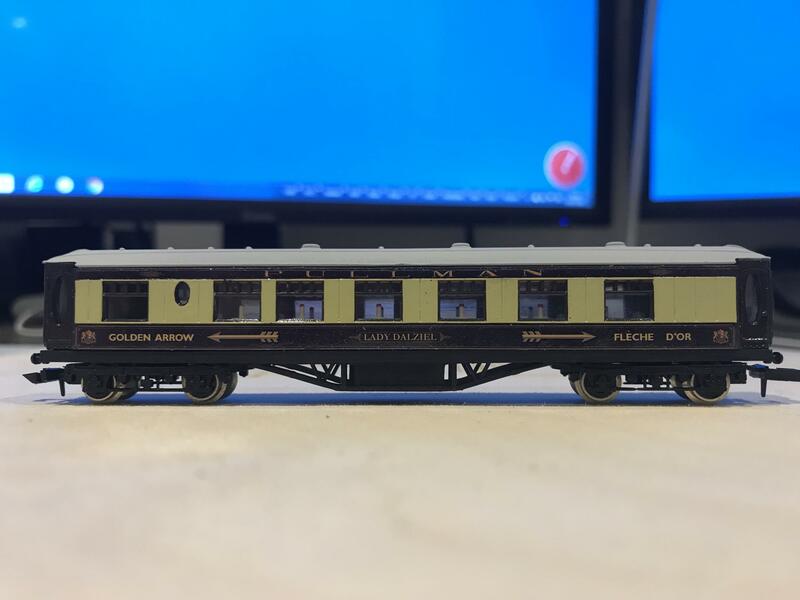 Thank you so much for this, very interesting to me as I love Pullman carriages. May I just ask, with this treatment do they end up the same colour as the newer Farish Pullman’s? 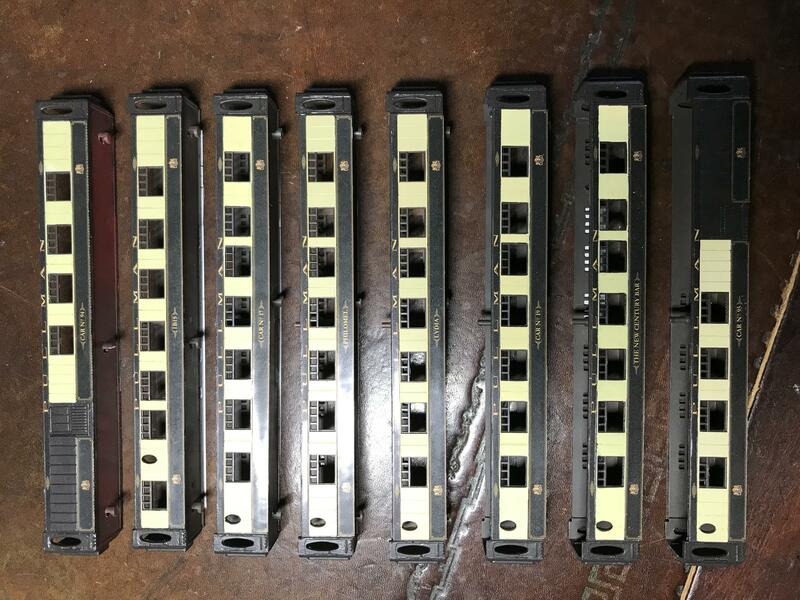 Thing is, I have 4 of the newer 374- series carriages and I also have 3 of the older ones, 0646 and 0656 I think the numbers are. What I am looking to do is gather together a rake which look something like the Orient Express set I have in OO. They are not the same but a good match. Keep in mind the early Farish (20's and 30's) are the wooden K's and the later ones are steel sided K's so it depends on your era. My plan is to run with King Arthur and early spam cans not Britannia locos which would be post war. Actually, before I started this project and read up on Pullmans I was not clear on the different generations of coaches. 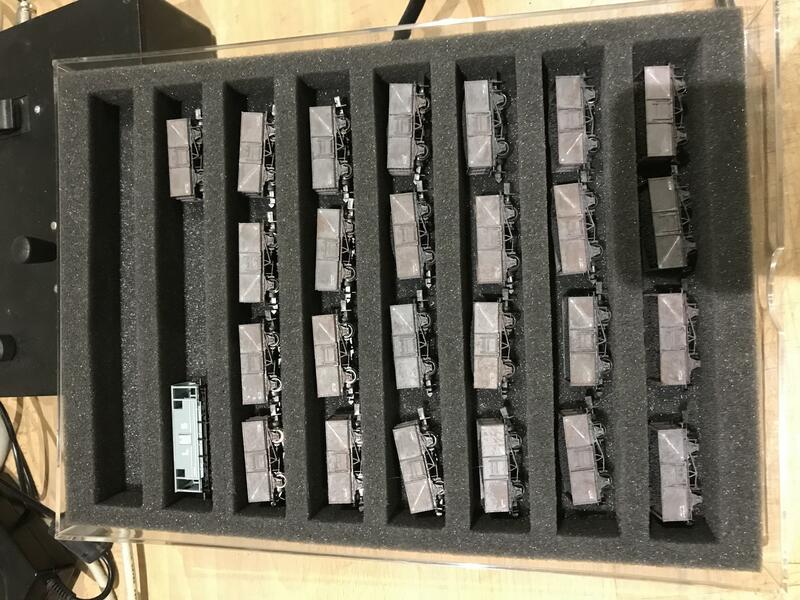 Part of making is to learn new things. 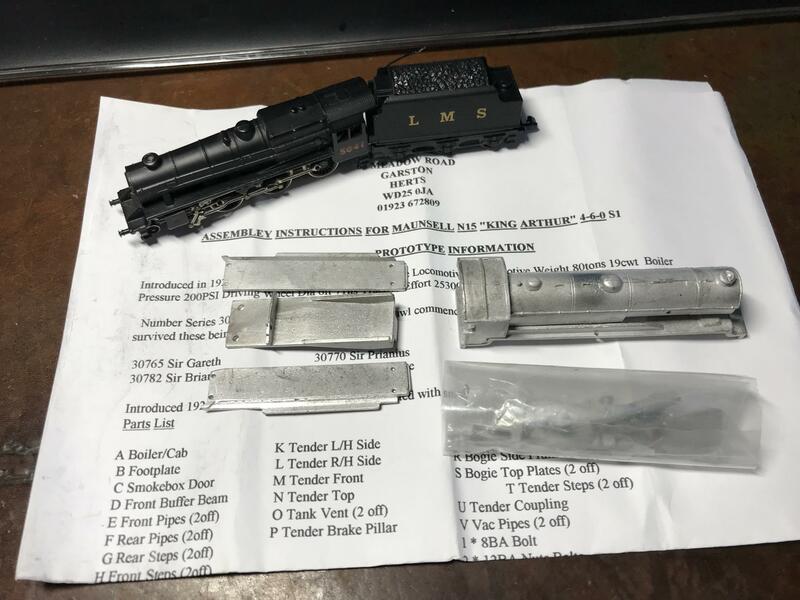 Anyway I have been trying to source some six wheel bogies for the heavy coaches. American Pullman coaches are fortunately similar and I can substitute Rivarossi and similar coach bogies (I hope). 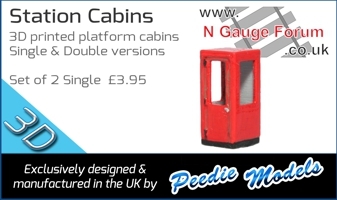 There is only so much conversion you can do and every window correct is a limit, however I am going to change the coaches with six wheel bogies, adjusting the pivot points, and I plan to make some modifications to the interiors where it will be noticed. I also plan to whitewash the windows where appropriate. 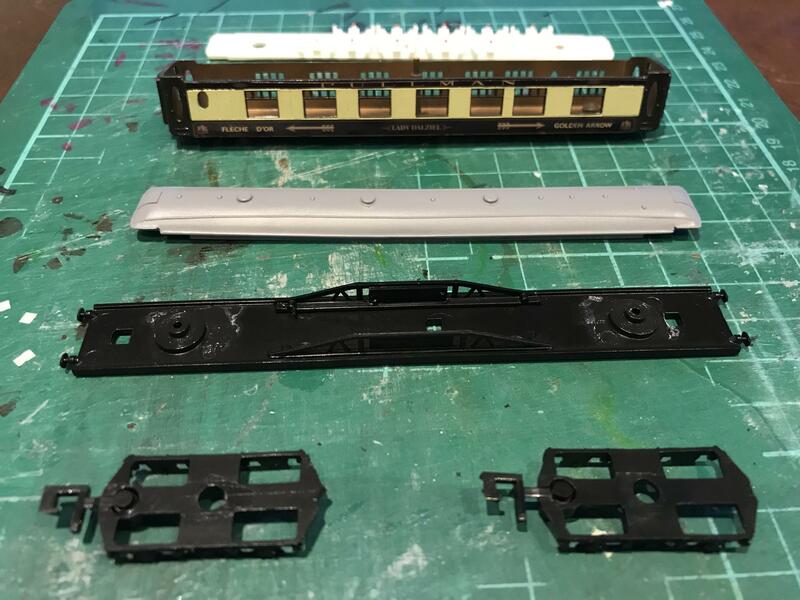 My thoughts this morning have turned to a suitable loco and I have extracted from my "to build" store a BH Enterprisese SR Class N15 King Arthur kit and and a late pool era black 5 for its mechanism. Progress last night allowed me to cut and fit all the sides and later this evening I will touch up the edges where necessary. I am also waiting on the arrival of copies of Pullman profiles 1 & 2 which I have perused several times at shows but not enough to memorize all the details and further changes will be made using them as references. Strictly speaking it is a strange mix including Car No 194 which was strictly a 1946 to 1951 addition. Page created in 0.124 seconds with 42 queries.